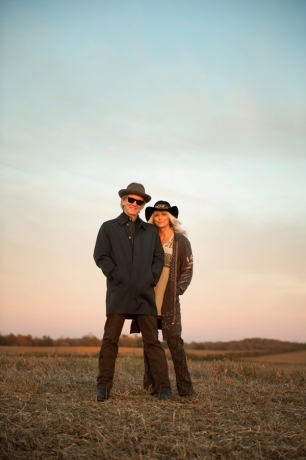 One of Rodney Crowell's earliest gigs was playing guitar in Emmylou Harris' band in the Seventies; now they've teamed again for Old Yellow Moon, a collaborative album with four new tracks written by Crowell and eight covers. Here, they ride effortlessly over the expansive horizon of "Hanging Up My Heart," by their frequent collaborator and steel guitarist Hank DeVito. "No more rodeo dances, no more howling at the moonlight," sings Harris. But despite the tinge of sorrow, it sounds like these country souls have found peace in what they're giving up. Old Yellow Moon is due February 26th.